A CLASH OF THE TITANS saw the top two teams in the PKL points table, Jaipur Pink Panthers and Puneri Paltan, vie for the pole position in the league. 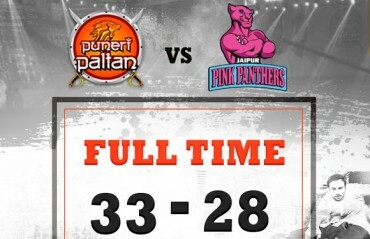 In the end it was Pune who came out on top, beating Jaipur 28-33 at their own home venue. JASVIR SINGH produced a phenomenal performance in the dying minutes of the match to help Jaipur Pink Panthers draw level with Bengaluru Bulls at Sawai Mansingh Stadium, Jaipur. A SUPERB ALL-ROUND performance from Rajesh Narwal and the thoughtful, calculative leadership of Jasvir Singh helped Jaipur Pink Panthers trump Telugu Titans 28-24 in a neck-to-neck game and begin their home leg of PKL 4 in a winning note. ANOTHER LAST MINUTE result enthralled the crowd on the opening night of Pro Kabaddi season 4 as two title contenders and fierce rivals fought till the dying moments, with U Mumba just about managing to come out on top over Jaipur Pink Panthers. ADDING TO THE HOST of luminaries taking the PKL for Season 4 are Rana Daggubati, Puneeth Rajkumar and Diljit Dosanjh, who have been signed as brand ambassadors of Season 4 of Star Sports Pro Kabaddi that commences on June 25th in Mumbai. BENGALURU BULLS looks like a team to watch out for in the PKL season 4 by strengthening their squad, signs star players of U Mumba, Mohit Chhillar and Surender Nada. Following are the full squad of the teams. BENGAL WARRIORS scored their third victory in four outings at home to leap to the top of the points table with 26 points by beating Jaipur Pink Panthers 34-20 in a Pro Kabaddi League contest in Kolkata on Wednesday. THE PATNA PIRATES got a sensational 1 point victory over Jaipur Pink Panthers in the first match of the night at Star Sports Pro Kabaddi in Vizag today. THE OPENING DAY OF Pro Kabaddi League season 3 will witness actor Aamir Khan lend a gloriously sombre touch to the celebration through a patriotic rendition of the Indian National Anthem. PRO KABADDI LEAGUE is all set to storm stadiums and television screens across India with its Season 3 beginning January 30, 2016.